Mr. Molesly is a great big cat, and like most cats, he likes to nap. 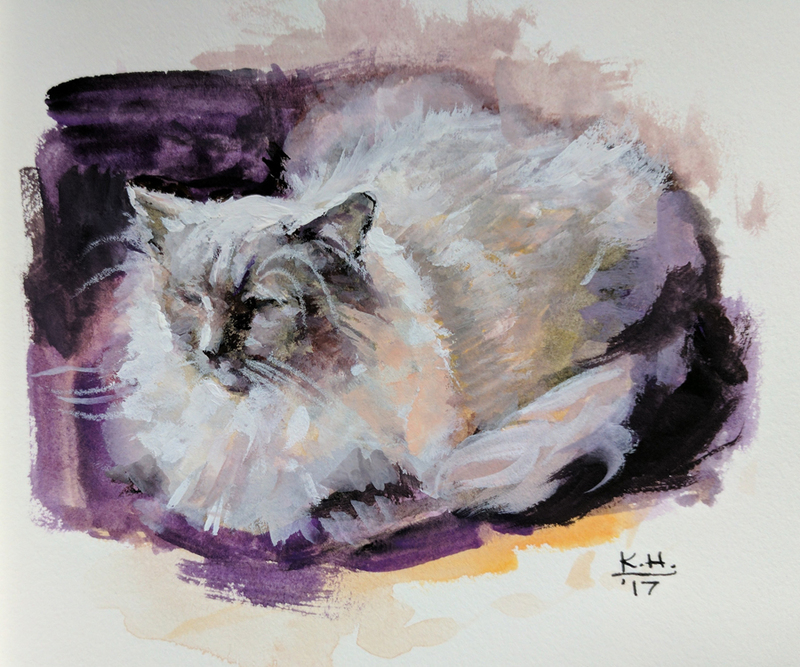 I have just enough time to capture a quick paint sketch in gouache paint (I used white, black, yellow, orange, and purple). He moved his head a few times, and when he would move,I would concentrate on painting other areas such as the tail or background until his pose was returned to the one I was trying to portray. All in all, I think painting from life captures the essence or spirit of the subject in a way that painting from a photograph never could. 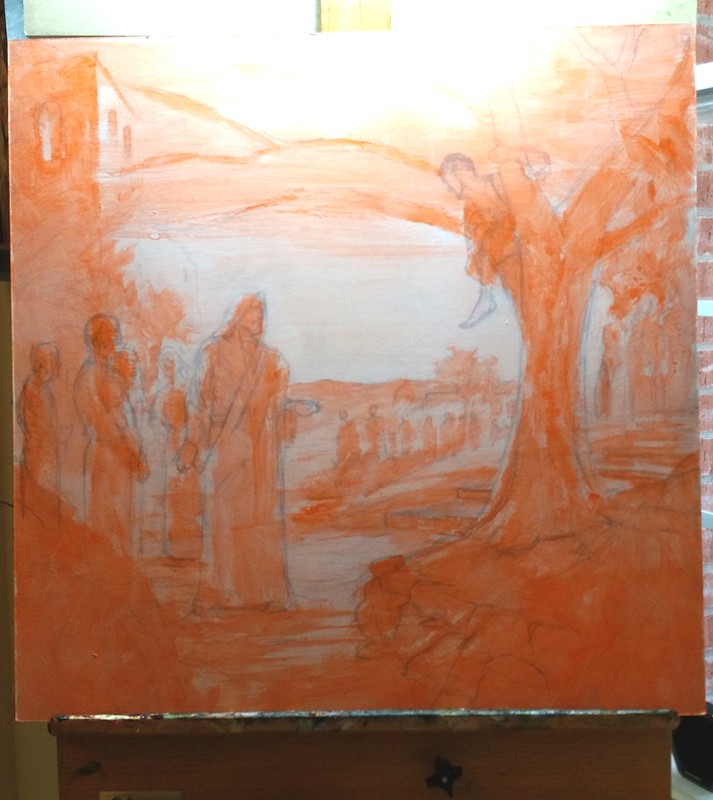 Not talking color theory, or about “mud” (when control is lost over the painting and warm and cool is in the wrong place). I’ll just share how I painted this picture out of my imagination, and painted the really warm next to the really cool colors. The most important thing I have learned along the way is use separate brushes for warms and cools. Imagine an old public service announcement with Uncle Sam holding up two brushes and saying, “keep them separate.” Even if you wash them with thinner, there will still be residue color left and the brush is, what I call, “compromised”. I keep two or three of every size brush. I will share the brushes I use in a future post. I have a very intense warm light from the sun, coming in from the back left area of the picture, where it is breaking through the storm. 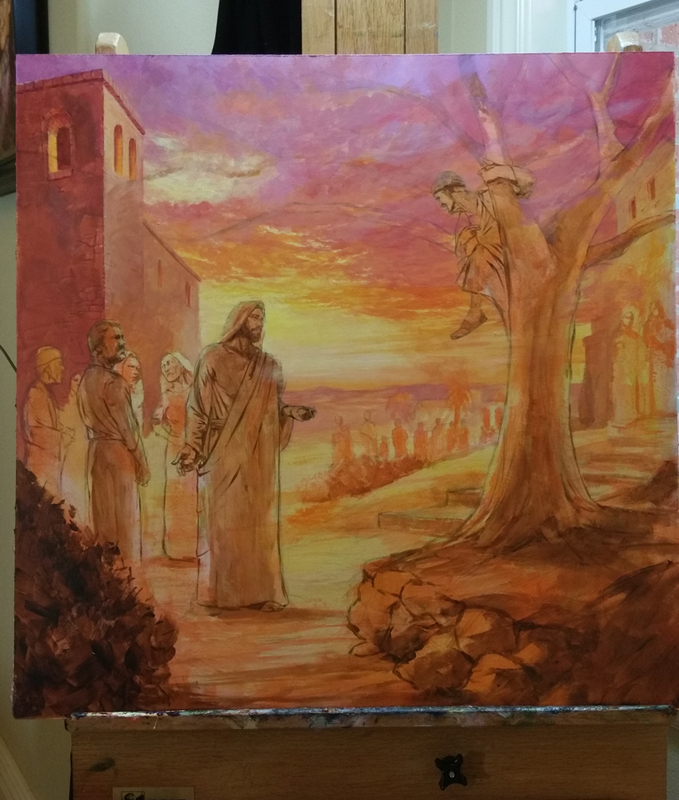 I could just have made the opposite side very dark shadows, but the figure might get lost in the dark background, so the other option is to push the colors very cool. I also noted to bring the very warm light through the mantle on the other side, and make the hair a more reddish as it would be warmer from the light as well. I often get asked how I work, or if I work digitally or traditionally. 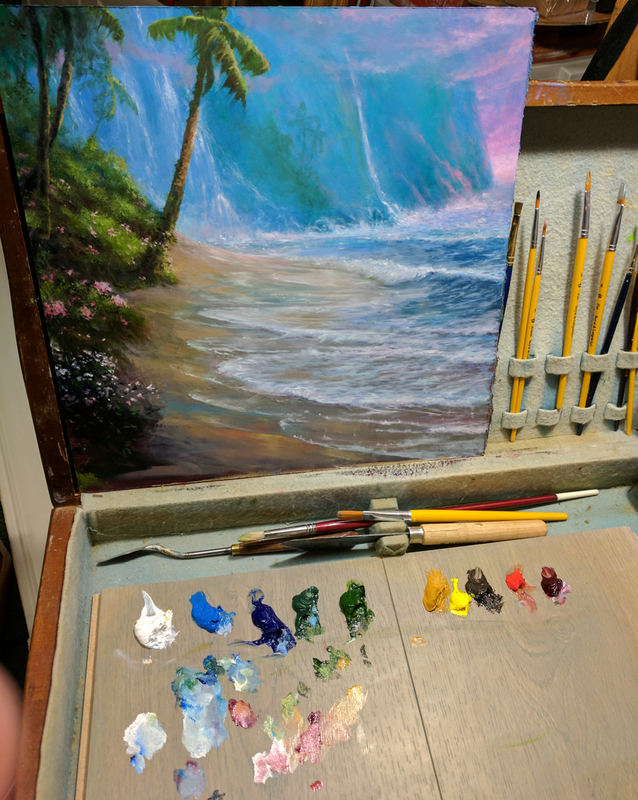 I work traditionally, not on a computer, I enjoy the craft of the painting process, actually using a brush I can hold and a paint that is tangible. The fact there is no “undo” or magic revert to the process. It’s still an art, not an image of art. When I’m done, I have an actual painting. 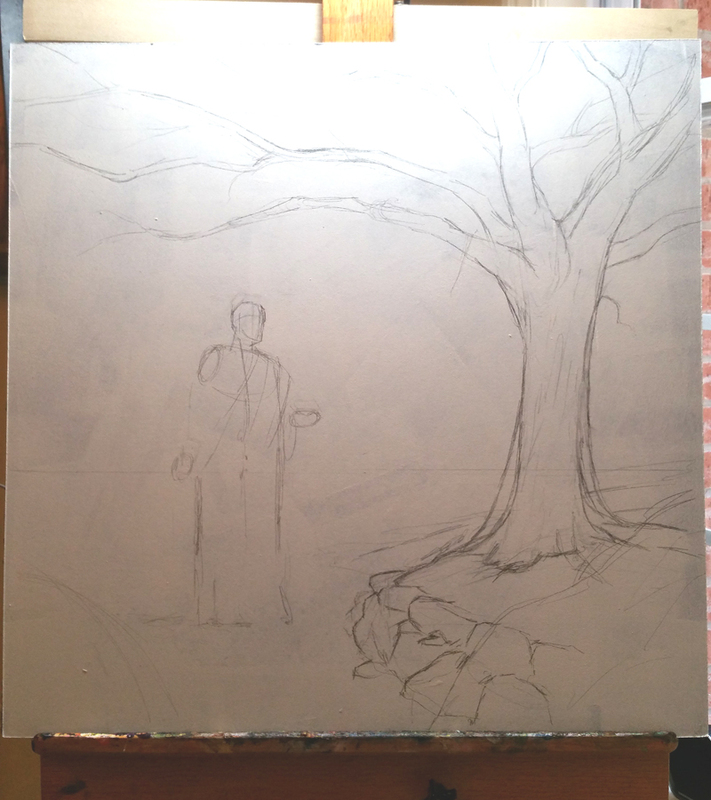 I use pencil on prepared masonite panels, with acrylic paint, and then oils. I’d say the acrylic to oil ratio is probably 20% acrylic and 80% oils. 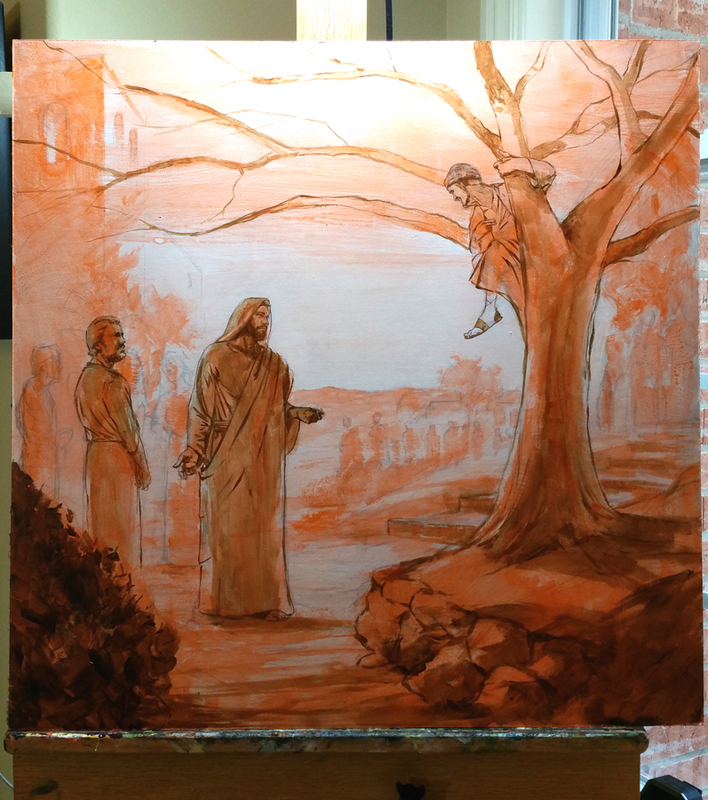 I use the acrylics for the quick drying time and for block-in areas. 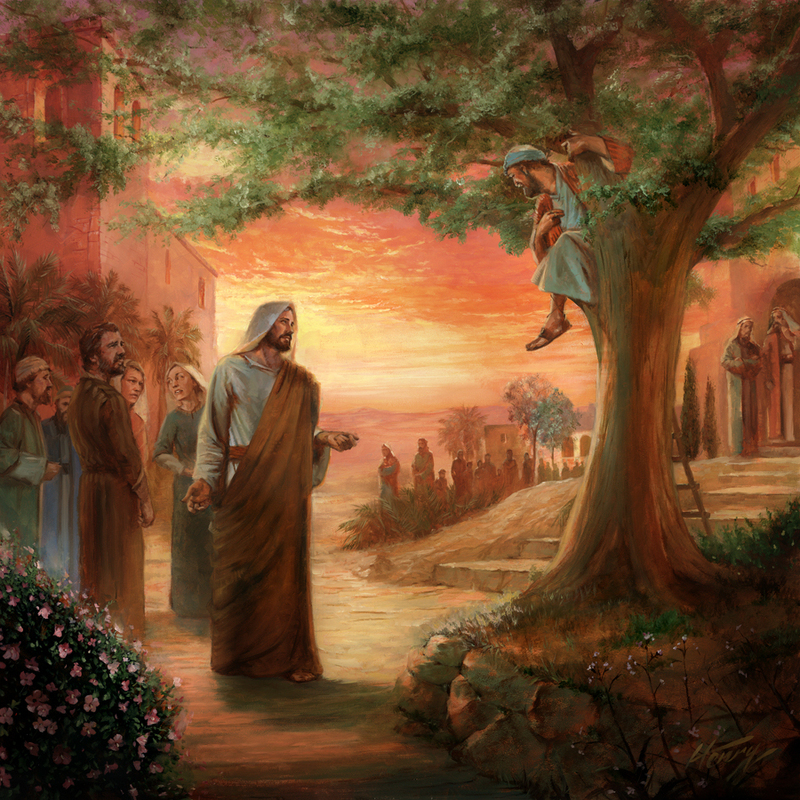 So I get my assignment which is to pa int Jesus meeting Zacchaeus. 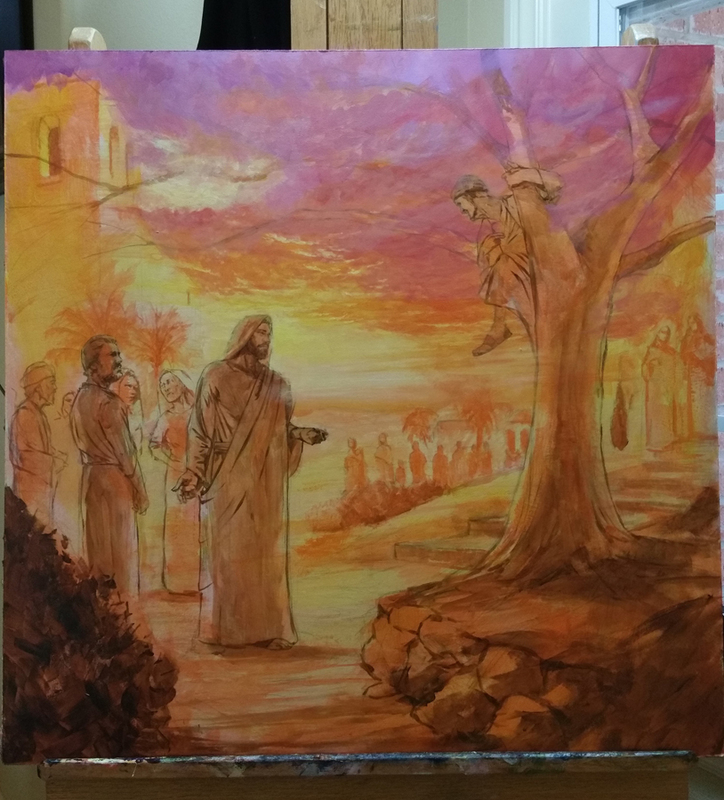 I look at all the available art that has been done over the years to portray this event. 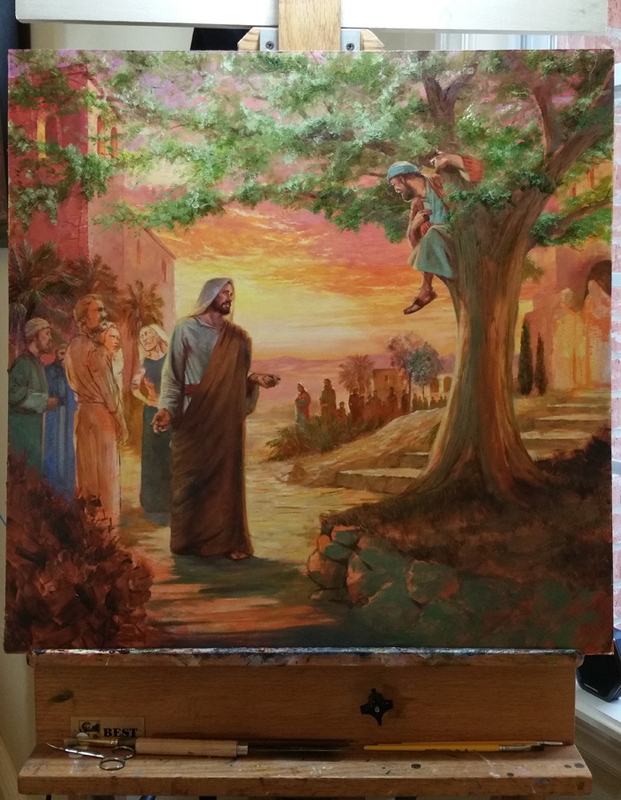 Some show the perspective of high in the tree over Zacchaeus’ shoulder, which confuses me a bit, as it places the viewer higher in the tree than Zacchaeus. As I wonder how I can paint this picture that hasn’t been seen a dozen times I notice a lot of the pictures look like middle of the day scenery, with blue skies. I get an idea. 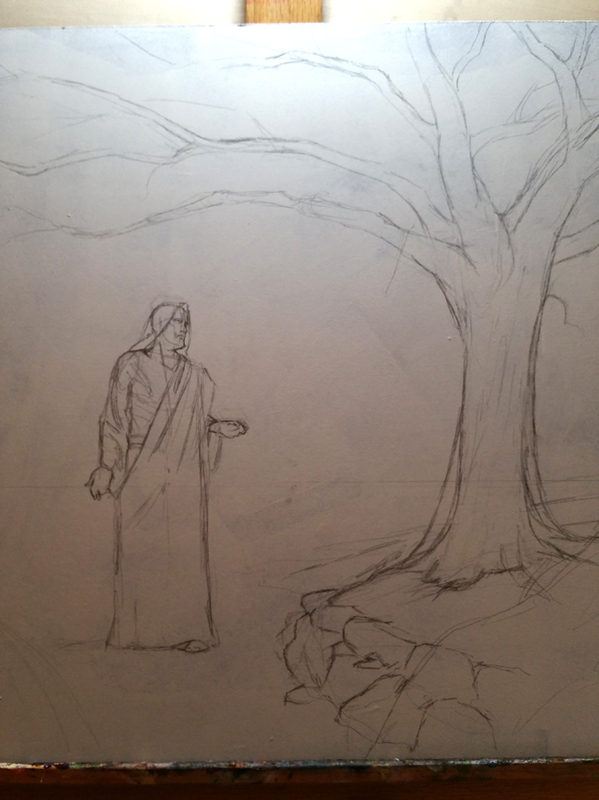 If I can’t do something completely different with a scene that is familiar throughout all of Sunday School-dom, I’ll just make it a “perdy picture”. I thought it might be nice to make the sky brilliant sunset, since it might be getting close to the evening meal. 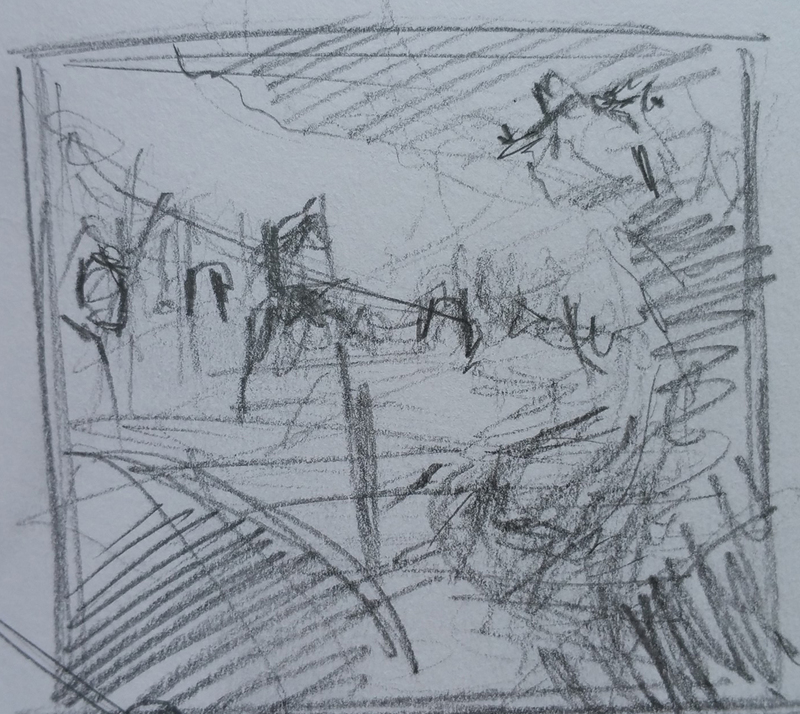 After I have worked out my composition through thumbnail sketches, I block in the drawing directly on the painting surface. 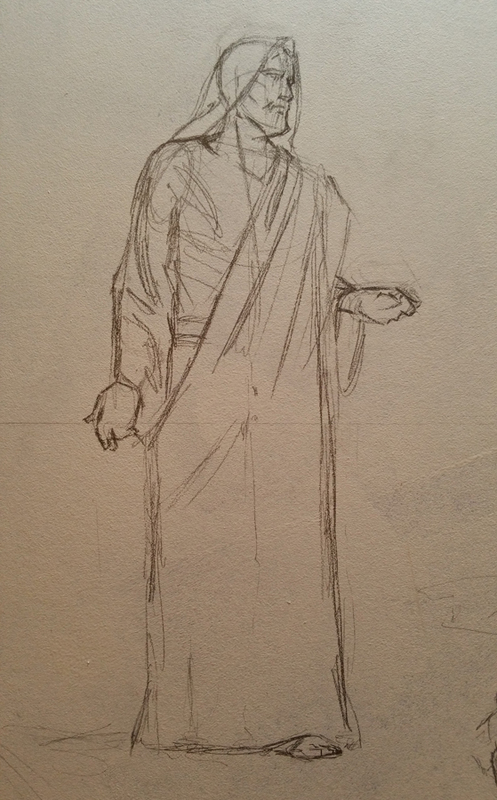 As far as photo reference, I will shoot photo reference, look in a mirror for hand poses, etc., it’s pulling ingredients for my own art soup, so to speak. 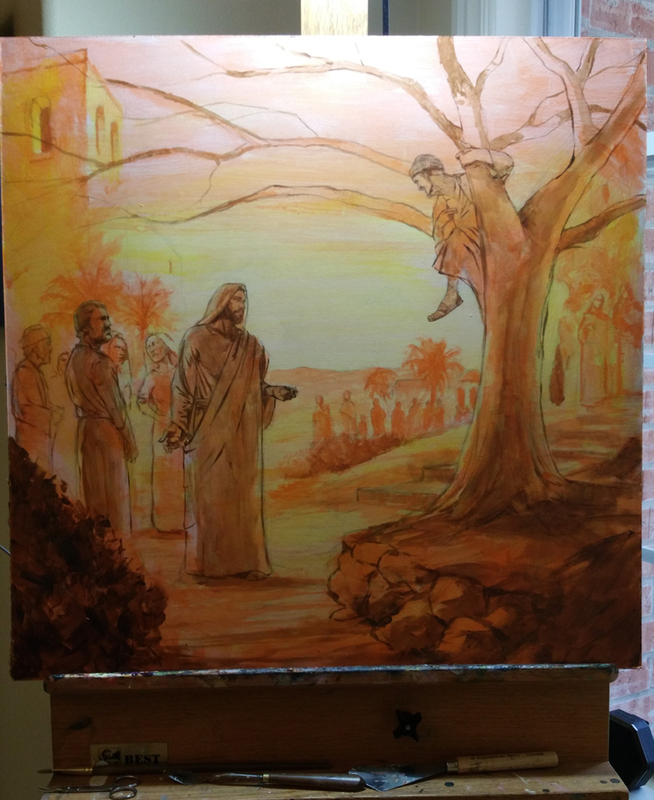 After I have the focal point of the painting, which is Jesus, I draw in the structure of the tree, without leaves (I paint those later). Here I start to achieve some depth to the drawing by showing some stones around a raised bed that might wind through the city. 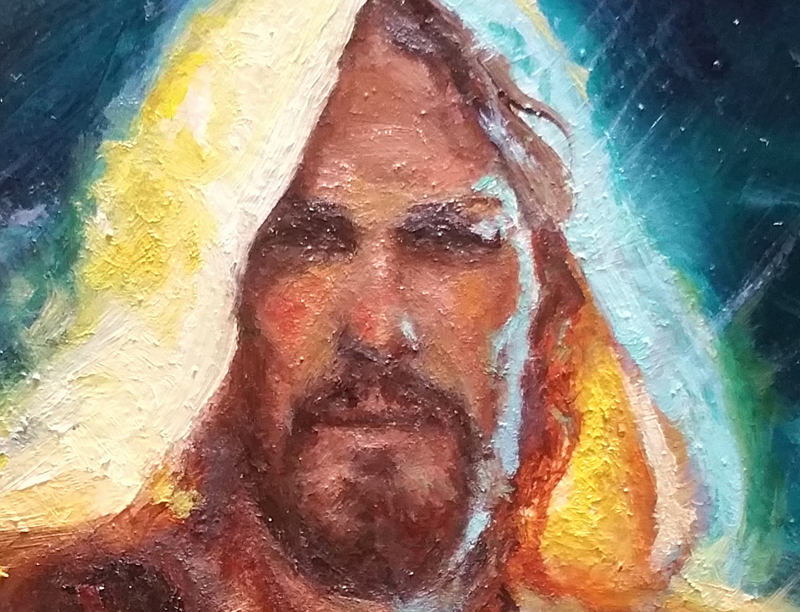 I make sure to leave plenty of open area around the figure of Jesus, this will allow Him to easily be the focal point from a distance. 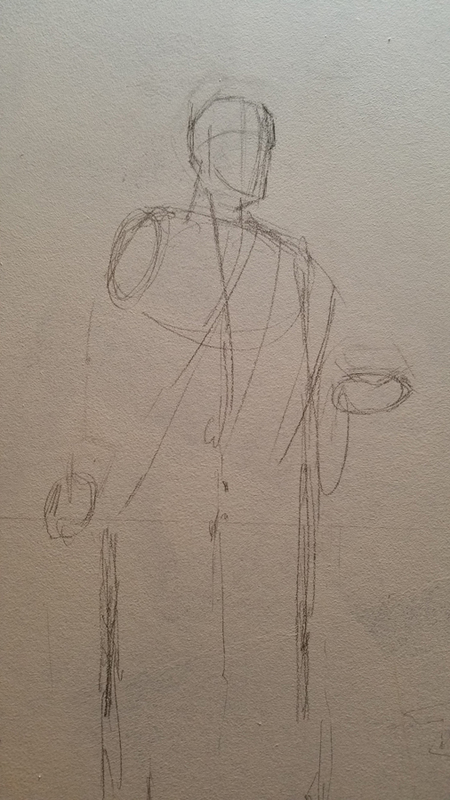 Using a combo of drawing from references of friends and family, and drawing out of my imagination, I work in the crowd and buildings. 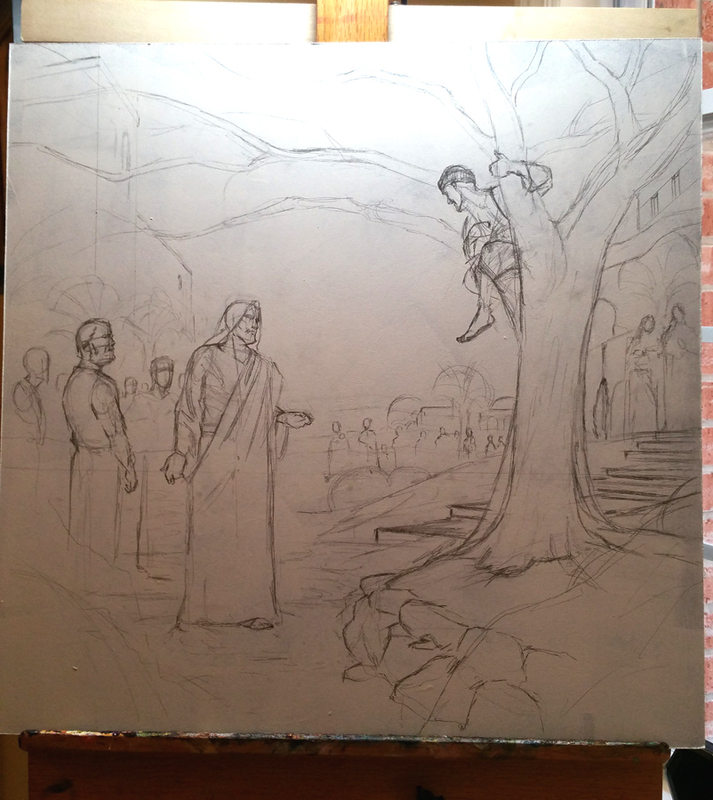 With the drawing to my satisfaction, I will leave it overnight and come back tomorrow with some Acrylic matte medium to seal the drawing and begin painting.